B2B companies that excel in producing qualified, sales-ready leads see an exponential increase in profits, and part of their success comes from integrating marketing and sales. 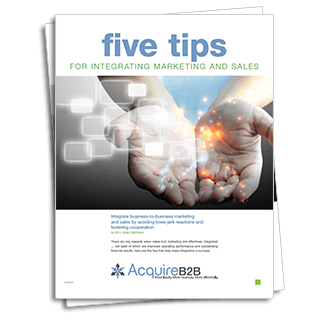 In Five Tips for Integrating Marketing and Sales, you’ll discover how to get on the fast path to integrated success, build more efficient operations, and reap greater financial rewards. To get started, complete and submit the form, and your copy of Five Tips will download to help you land more sales.